Cancer treatments are designed to kill cancer cells. But these treatments can also damage healthy cells. Damage to healthy cells can cause side effects, and some of these side effects can lead to eating problems such as appetite loss, changes in taste or smell, nausea and weight loss. Because of these side effects, many patients undergoing cancer treatment adjust their diets and cooking habits. The American Cancer Society, as well as numerous cancer institutes, chefs and culinary resources, have adapted favorite recipes to meet the needs of cancer patients undergoing treatment. This bulgur salad and dried fruit recipe from the American Cancer Society‘s What to Eat During Cancer Treatment and published by USA Today addresses the common cancer symptoms of constipation and taste alterations. However, at just 140 calories per serving, it can fit into anyone’s diet or even doubled and still be a healthy lunch. 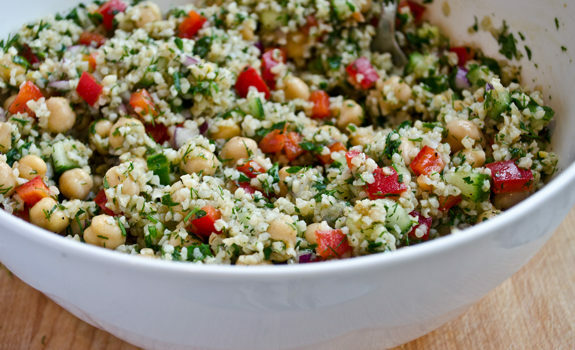 Bulgur, also known as cracked wheat, is one of the most fiber-rich grains. Another plus — unlike other grains, it doesn’t require a long cooking time. It only needs to be rehydrated in boiling water for about a half-hour. Get all the other ingredients ready while the bulgur soaks. If you have some fresh Italian parsley on hand, chop 1/4 cup of it and sprinkle over the salad before serving. If you don’t have the time or inclination to squeeze an orange, you can use a high-quality 100% orange juice that is freshly squeezed (not from concentrate). Be sure to buy juice that is pasteurized. 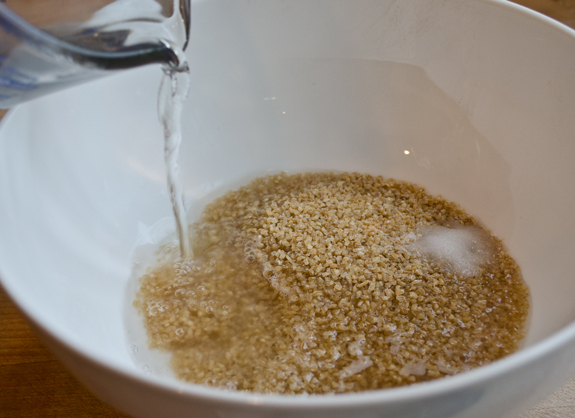 In a heatproof bowl, combine the bulgur and water and let stand for 30 minutes. If the mixture is absorbing the water too quickly, add 1 tablespoon or more water. When the bulgur is tender, add the apple, cranberries, raisins, scallions, and mint. In a bowl, combine the olive oil, lemon juice, and orange juice. Add to the salad and stir gently to incorporate. Season with salt and pepper. Cover and refrigerate for at least 1 hour. Add the almonds just before serving.